My husband, the Serb, is not known for his cooking prowess: when we first met he was subsisting on sandwiches and cereal. Things didn’t change much after we were married – before leaving on business trips, I would go through various takeout menus and highlight the things he liked so that he wouldn’t starve (his friends were equal parts envious and mortified). Me: What did you have for breakfast? After having kids, he managed to learn a few pasta dishes and he’s a whiz on the barbecue, but the Serb often voices his wish to cook more. For his fortieth birthday my parents gave him a cooking lesson, which he attended this past weekend. (1) My daughter lost my husband’s wedding ring and I’m trying not to take it personally, but her admonishments that I’m not married to “her” daddy make it difficult. (2) Before leaving, my husband removed the manicure my daughter had given him (OPI’s Pink-a-Doodle) that morning. (3) The Serb and I express our love in ways that may seem…inappropriate…to the uninitiated. 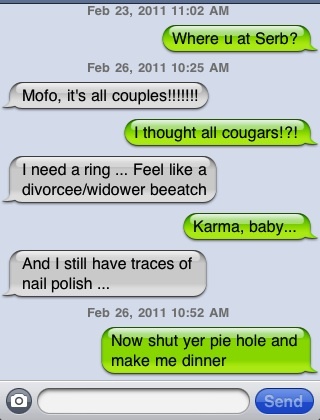 This is a fairly typical textversation. Afterwards, my iPhone was silent for two hours. I had visions of him being manhandled by some foxy forty-somethings or sitting alone in the corner while couples fed each other bison sliders. I feared that whatever he was enduring would put him off cooking entirely. None of these things happened. As soon as he sat down, a couple of grandmas (Peggy and Penny) swooped in and took my Serb under their collective wing, doting on him for the entire class. Also, it was a cooking demonstration class and he wasn’t actually expected to cook – he simply sat back and enjoyed the show, with unlimited refills of Pinot Noir. Not only that, the dessert was a baked apple dish that his late grandma used to make in Serbia when he was a boy. So to recap, my husband got babied by some sweet old ladies while a professional chef fed him and liquor store employees saturated him in pricey hootch. It was, in his words, the Best. Saturday. Ever. I think a family that communicates through humor, snark and sarcasm is the funniest kind of family. Sounds like my kind of class, btw. And that liquor store thing is genius, because he walked out with a hundred bucks worth of wine! I can’t tell you how happy it makes me that you’re thinking of my pits!!!! I’m ordering some today – I’ll let you know how it goes…thanks SO much! We really do need to get back to the pits. Mine are starting to stink again after months of reprieve! I’ll go on down now and comment where I’m suppose to. Did you see stay at home babe’s comment with the cream? I plan on ordering some and maybe you and Juliette can whip up a home-made version? LMAO!! Totally out of his element. As long as he enjoyed himself! Holy Moley!! FUNNY!!!!!! My hubs and I have similar text exchanges, I think it’s healthy…or a precursor to one of us being on 60 minutes while the other of us is found floating in the nearby river…Anyhoo, I’m with the Serb: cereal = meal for all occasions and nothing beats getting fed by a chef, pampered by old ladies, and given pricey booze! OK, very funny! I’ve lost my train of thought because I’m off thinking about my strange stinky pits….OH, get him chrome color nail polish. It’s not so bad 😆 when he had to go out into the world. I think Michael’s nails were chrome color for at least 3 yrs. I wanna go! That sounds like fun, minus the granny part (old ladies get on my nerves, however I find old men HILARIOUS!). You should have gone with him…schedule again- or better yet, take your girlfriends with you!